Sometimes, we get lost in life—really lost. That has been Jeeves’ story. His new rise began when he wandered into the yard of some kind strangers in west central Florida, during ‘winter.’ His bones were covered by an expensive jacket—someone had cared about him. The strangers were unable to find his owners—his microchip was unregistered. A deleted Craigslist post indicated that his owners knew about and were trying to address a medical issue, but the deleted status, which removed contact information, indicated that they must have given up hope that their dear boy could have survived. While the strangers were very dog-friendly people, they were afraid that their big dogs would unintentionally damage this very fragile, frail boy. 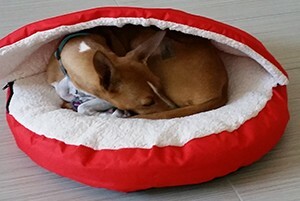 Their vet thought he looked like a Basenji, so Camp Basenji ranks were about to grow. 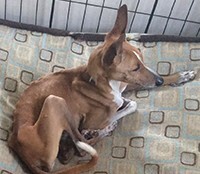 When Jeeves first arrived at his foster home, the shock of his condition blinded his foster mom to the fact that he was really a Basenji mix. She could only see his bones and marvel that this boy seemed happy and was alive. She went to task to fix him. Care must be taken when bringing back one who is so far gone, so his foster mom had patience, slowly increasing his food to make sure that he did not bloat or go into shock. After a week or so (and before the deleted Craigslist post was found), it was apparent that his condition was due to more than a simple lack of food. Examination of his stool and symptoms quickly led to a diagnosis of EPI, exocrine pancreatic insufficiency—a lack of digestive enzymes. Food could be poured into this sweet boy without ever getting him to gain a pound without the addition of digestive enzymes. With that, and Vitamin B12 injections, Jeeves suddenly began to gain weight. His bones, once so painfully prominent, began to disappear! Now, his foster mom could start to see if there were other concerns. More investigation into his microchip indicated that sweet Jeeves was at least thirteen years old. Examination of his body revealed many scars—poor Jeeves was likely attacked by another dog or two at some time in his life. It is amazing that he is still so social and trusting when with other dogs. While food and exercise would definitely improve his condition, damage to joints where some of the scars are located will be permanent. It doesn’t bother easy-going Jeeves much. He is happy enjoying life with whatever limitations are thrown his way. Jeeves continued to thrive in his foster home, finally gaining enough weight and strength that he could join the general population. Though Basenjis are his size, they play rough. His foster mom cringed every time Jeeves got bumped and fell down, but he got right up and jumped right back in with the group. Then and now, this boy wants to live life to the fullest! 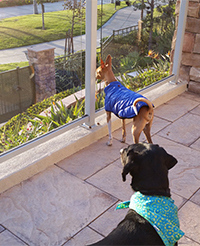 Jeeves in CA, with a view and a new loving family! At thirteen plus years old, and in need of digestive enzymes to be added to every meal, his foster mom figured that Jeeves was going to live out his days with her. That was just fine. He is a delight—easy-going, always happy, always pleasurable. Few dogs of any breed are ever this wonderful. There was, however, a wonderful woman who saw all that Jeeves had to offer, and really wanted him. There was just one catch—she lives in California, a long way from Florida. Jeeves is too old for his foster mom to consider putting him on a plane, and he was a bit too big and leggy to hide under a plane seat. The modern miracle of social networking online, though, was just what Jeeves needed. He found a ride to his new mom, with just one set of loving hands between her and his former foster mom. His ride complete, Jeeves has risen like a Phoenix from what seemed like certain death and found his happily ever after, where he enjoys long daily walks, canine visits and showers of admiration by all that he meets! Congratulations to Jeeves and his wonderful owner!